C’mon! Get in step! The Mark Brody Memorial Kidney Walk and Celebration is an inspiring community event to raise awareness about kidney disease and to promote organ donation. 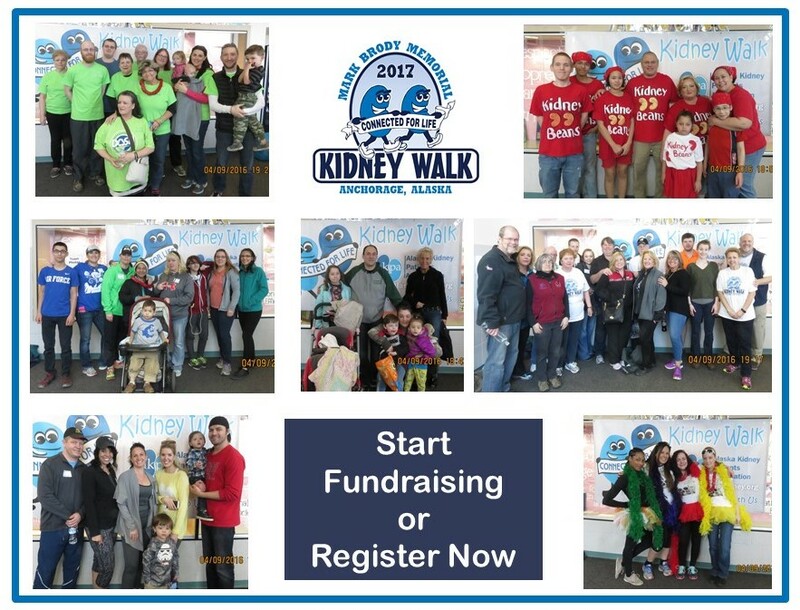 We walk for kidney patients, families and people at risk for kidney disease because taking care of Alaska’s kidneys is what we do!! We will be walking inside in the gym, or if the weather is nice you can walk on the track outside. Come prepared for family fun, raffles, refreshments, costume contest, and of course walking! One of the biggest challenges for dialysis patients is diet and nutrition. 90% of Dialysis Patients in Alaska are on Medicare, not because they want to but because dialysis takes so much of their time. On a good day a patient may spend four hours at dialysis, but on a bad day it can take much, much longer. With limited income, the restrictive renal diet that dialysis patients should follow is challenging, especially the increased protein intake. One of the AKPA's major goals is to assist Alaskan dialysis patients improve their nutritional choices with a few tools – crockpots and stick blenders – and dialysis friendly food cupboards. To date the AKPA has distributed over 125 crockpots, 50 stick blenders and opened a food cupboard in Juneau. All Kidney Walk participants who raise a minimum of $100 will win a 2017 Mark Brody Kidney Walk t-shirt or one of the prizes below! *There are no registration fees or fundraising minimums to participate. All the money raised by the AKPA stays in Alaska!! Please join us in spreading the word about the 2017 Mark Brody Kidney Walk–together we can save lives!